The main story for the film was the legend of the Greek king Agamemnon’s daughter, Iphigenia, sacrificed to the war goddess Athena. Homer’s poem Iliad tells that, wishing to become winners in the ten-year Trojan War, the Greeks more than once sacrificed their daughters to please the whims of Gods. Being one of the initiators of the campaign on Troy, Agamemnon could not refuse the fate that had befallen her daughter, and she was elevated to the altar, Athena Pallada. Marveling at the beauty of the girl, the goddess did not accept this gift. Replacing the girl with a deer, she transferred her to Tavrida, where she became one of the priestesses of the temple of Athena. In the picture of Serov, Iphigenia is depicted already after her arrival at the shores of Tavrida. The girl sits on a stone by the sea and thoughtfully looks into the endless distance. Her face is not visible, because the viewer is not given to understand whether she is sad about her lost loved ones, or whether she is feeling lonely. The body of the girl is dressed in white clothes, which fully corresponds to her position as an innocent priestess at the temple. According to the custom of the time, the hair of Iphigenia is gathered on the back of the head. 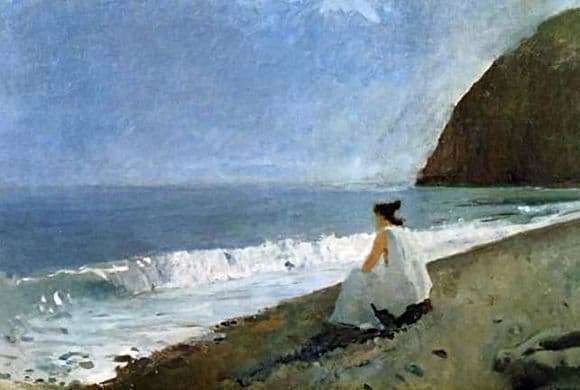 The nature surrounding the girl is pristinely beautiful, the waters of the Black Sea foaming at her feet, shining blue sky spreads over her head, inaccessible cliffs rise behind her. The sea and sky merge into a single whole, with the naked eye it is hardly possible to distinguish the edge of the water from the clouds and the horizon line. There is not a single living soul on the shore, and Iphigenia may not fear for its unwitting peace. It is not known whether this girl is happy or not, her destiny is now and forever connected with these deserted places, so unlike their beloved homeland. The canvas was created in 1893, repeatedly subjected to restoration, stored in the State Museum of Fine Arts of the Republic of Tatarstan. It is a vivid example of the creativity of peredvizhniki artists.